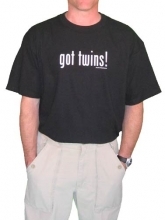 Got Twins Dad T-Shirt Discounts Apply ! This popular shirt is now available for Dads! Available in black, navy blue,white or gray.